KUALA LUMPUR (Reuters) - Malaysia should reverse a ban on a Christian newspaper using the word "Allah" to refer to God, a U.N. official said on Monday about a decision that fanned religious tension in the mainly Muslim country. 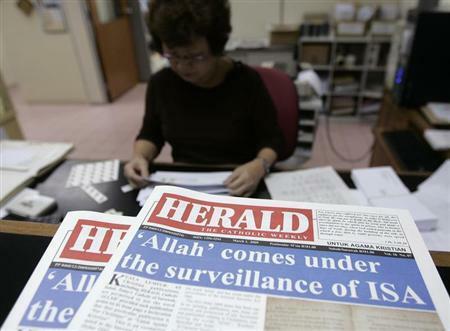 Malaysia's second highest court ruled in October that the Catholic newspaper, the Herald, could not use the word "Allah" to refer to God, in a landmark decision on an issue that has fanned religious tension in the majority Muslim country. "Freedom of religion or belief is a right of human beings, not a right of the state," the U.N. special rapporteur on freedom of religion or belief, Heiner Bielefeldt, said in statement. "It cannot be the business of the state to shape or reshape religious traditions, nor can the state claim any binding authority in the interpretation of religious sources or in the definition of the tenets of faith," he said. The chief judge in the Malaysian court said the word Allah was not an integral part of the faith in Christianity and that its use by the newspaper would cause confusion. Since then, confusion has reigned over the interpretation of the ruling, with government ministers, lawyers and Muslim authorities giving widely diverging views on its scope. Critics of the ruling have said it casts a chill on religious and minority rights in Malaysia, which has substantial minorities of non-Muslim ethnic Chinese and Indians. "The current case may affect the right of all non-Muslims in Malaysia to use the word 'Allah' while referring to God," the U.N. official said. Lawyers for the Catholic paper had argued that the word Allah predated Islam and has been used for centuries by Malay-speaking Christians in Malaysia's part of Borneo island. They said they planned to appeal against the decision in the country's highest court. Christians make up about 9 percent of Malaysia's 28 million people. Muslims are the majority at about 60 percent.